I’m a Kansas fan. 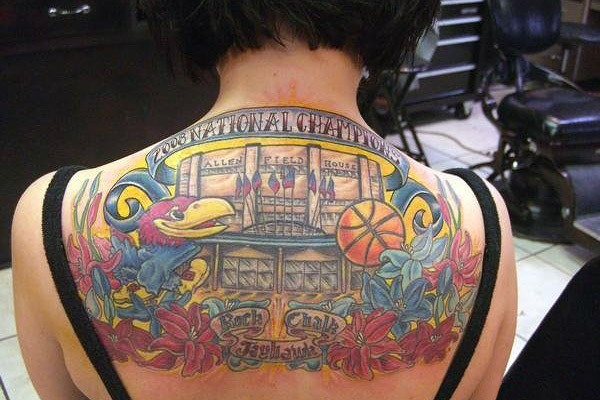 Rock Chalk Jayhawk and all that jazz. While all great programs have a hate-respect relationship, it always got under my nerves that people think Cameron Indoor is the premier venue in college basketball. It’s Allen Fieldhouse. From Duke grad and reigning honcho of the college game, Jay Bilas, in regards to Allen Fieldhouse, “I thought the atmosphere was unbelievable. I’ve been here before, but it’s just such an unbelievable place. It has such character. I can’t say I’ve ever been in a better arena.” FYI, that was in 2005. He said it again in the 2012 matchup versus Baylor. Duke fans have a natural bandwagon element to them, and you can especially feel it when you’re in North Carolina. For people in NC who were born in my time (mid-80s), you were born beside two great programs that bore your state’s name on the chest of the jersey. How do you end up a fan of the private school that imports their student body and most of their fan base? Other top programs are proud representatives of their states: Kansas, Kentucky, North Carolina, Indiana, etc, and you don’t hear many people outside of birthplace/home/family connection that cite them as their favorite team. Having no state affiliation actually makes people feel like it’s safe for them to be Duke fans, but truth is, they’re bandwagon fans. The worst thing in sports. Bandwagon fans betrays the purity of any sport’s success. Try to ask someone why they’re a Duke fan. The answer always disappoints you. Here’s what I’ve heard. Duke always seems to have an easy-to-hate player. I’ve always dreamed of handing out the annual “Douche Blue Devil Award”. Past winners include Josh McRoberts, JJ Redick (3x winner) and Carlos Boozer (after reading Five Point Play, I’m convinced that Coach K didn’t even like Boozer). 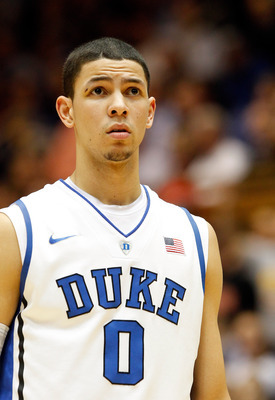 This year it’s Austin Rivers. Most people know about how punchable his face is (second paragraph in the “Overrated Team – Duke” section…also, when referring to Austin Rivers’ Punchable Face, it is to be spelled “ARPF” and pronounced like the noise a seal makes. I consider this to be Mark Titus’ greatest contribution to college basketball this season), but how about his general opinion of himself? Start reading from the 3rd paragraph of this article, unless you’re Anthony Davis because you’ll only get pissed off. If Grant Hill was Duke’s star player every year, I’d probably be a Duke fan. Too bad he’s not. I don’t have a whole lot of time tonight, so I won’t drone on any longer. Tomorrow (I wrote this the day before you read it), I’m pulling for UNC. I’ll root for Roy like I did in the 90s…I might even get carried away and yell, “Atta boy, Pollard!” when Tyler Zeller does anything (sorry UNC fans, but when it comes down to final results, Tyler Zeller is Scott Pollard – a 19th overall pick with a ten-year NBA career as a serviceable big…and really, that shouldn’t be frowned on). And the Plumlee’s just aren’t very cool.